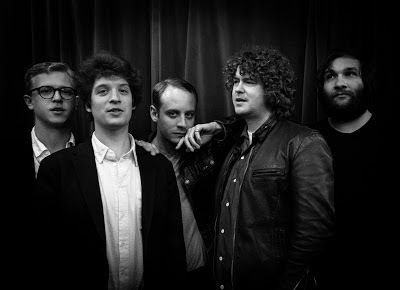 Quirky NY Chick: Deer Tick - "The Rock"
Deer Tick - "The Rock"
When the new track from Deer Tick landed in my inbox, I initially kept it as new and moved on. A couple of days later, I gave it a listen. "The Rock", from their upcoming album Negativity, caught me by surprise. I'm not a huge Deer Tick fan yet, I found myself putting the song on repeat. The track begins rather delicate and vulnerable before kicking into a rocker, infused with a grand blast of horns. I now find myself curious and looking forward to hearing the upcoming album which will be released on September 24 via Partisan Records. Last week, the video for "The Rock" was released. It's a black and white affair that consists only of Deer Tick leader John McCauley. The clip is about four minutes of an up close view of his face. My first thought was, 'I don't know you like that!' It's somewhat uncomfortable to watch and decidedly intimate. I felt determined, perhaps compelled even, to resist the urge to avert my eyes. And, I admit, it did take several views to sit through the entire video without turning away. The Colin Devin Moore directed clip has the effect of one of those silent conversations you have with your significant other. Again, I don't know you like that Mr. McCauley. The song, one of heartbreak, gives this uncomfortable clip an intensity that for a brief moment, makes you feel some sort of a connection to those eyes that are staring at you from the screen. So perhaps, for a little over four minutes, a small part of me, the viewer, does on some extremely minuscule level, know you like that.